The complete unedited and previously unreleased 1965 BBC transcription recordings. 9. Who Can I Turn To? All 20 tracks are previously unreleased. Recorded in the summer of 1965 at Kensington Studios in London, England by the BBC and subsequently sent to Spanish radio stations as Radio Transcription discs to be broadcast only on Spanish radio in the late 1960's. These previously unreleased studio recordings feature pianist Gordon Beck, drummer Johnny Butts and bassist Jeff Clyne. The Tubby Hayes Quartet is presented in a series of four seperate programmes designed to showcase Tubby's unprecedented talents on tenor saxophone, flute and vibes. 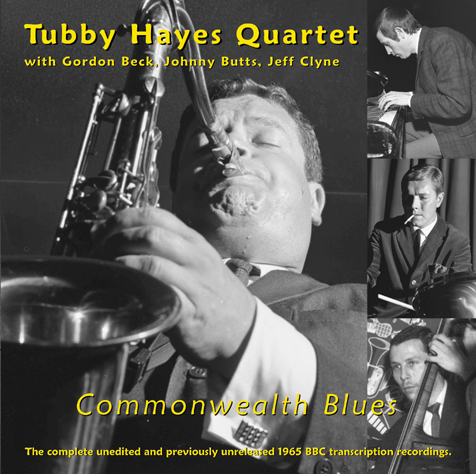 Each of the four programmes begins and ends with the theme, Tubby's Blues, a song later retitled by Tubby as Commonwealth Blues. Art of Life Records, along with the assistance of Gordon Beck, has obtained the exclusive licensing rights from the British Broadcasting Corporation to make these recordings commercially available for the first time!! The CD comes with a 16-page booklet containing 12-pages of detailed and insightful liner notes which includes a historical overview of Tubby Hayes' recording career as well as how this classic British Jazz recording came to be. A must have recording for all Tubby Hayes fans as well as fans of British Jazz!! All tracks have been digitally mastered using 24-bit digital technology. Released on compact disc in 2005 on Art of Life Records.